Blackburn with Darwen Borough Council is investing £1.5million in creating a fantastic new public space in the heart of Darwen: Darwen Market Square. 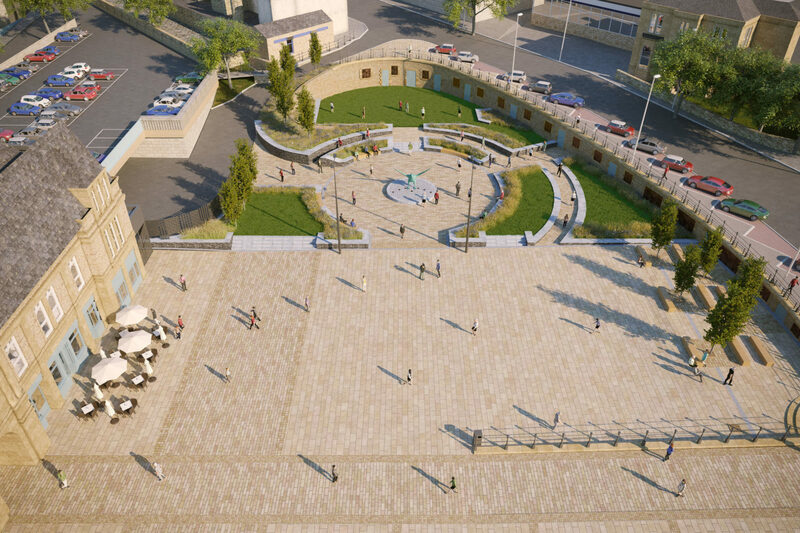 Through consultation, the square has been designed for large scale events, socialising, relaxing, reflection and potentially even retail, with the people who live and work in Darwen as well its many visitors in mind. A key focus has been on creating a balance between a future looking, contemporary, fit for purpose space whilst observing and preserving the attractive natural and historical features within and around the site. Darwen Market Square development began at the end of May 2018. During the works there will inevitably be some disruption, this will be kept to a minimum and information will be published on this website to keep people informed. Blackburn with Darwen Borough Council worked closely with Darwen Town Centre Partnership Board and the Heart of Darwen Design Reference Group, amongst others, to gain invaluable input into the design process and ultimately the final layout plans you see in the image. Will There Be Any Disruption In Town? Whilst this work is taking place we understand you might have a question or two. If you cannot find the answer you need in our FAQ section then please submit your question using this form and we will endeavor to answer it for you – either here on the site or direct to your email if appropriate. To receive the latest information and updates direct to your inbox, sign up here.